A beautiful view! Inspired by 19th century Impressionist paintings, this Beautiful Summer Canvas in full bloom creates an instant focal point in your room. Print on canvas, gallery-wrapped on a wooden frame, arrives ready to display with cord hanger. Imported. 24" x 36". Hurry! Quantities are limited! Bright beautiful landscape. Excellent value. 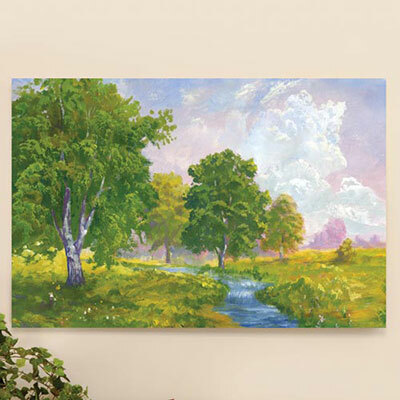 Will warm any room with serene summer thoughts.